Paul hails from Hereford and was born in 1980 – 29th May to be precise, cards and presents will be gladly received… in fact make a note of that date! Graduating from University in Bristol in 2004 with a degree in the thrilling discipline of Information Technology, he was unsure of what he wanted to do. 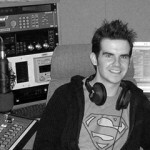 He’d been doing Hospital Radio in Hereford for a few years and loved it. 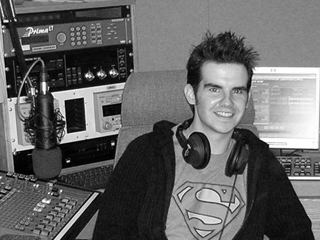 After attending a short one week course in Radio Production in Bristol in the summer after he finished University, he decided that radio was for him. He then discovered the MA course at Bournemouth University and set about saving up some money so he could (for the final time) become a student again. Paul lived in Bristol for 18 months and was working full time at Clarks shoes, where he originally started as a Saturday boy when he was 16. He got an evening job at the Bristol Old Vic theatre working on the stage door, a job which he absolutely loved; one evening Richard Wilson aka Victor Meldrew turned up at the stage door to see Sir Ian McKellen who was in a play, Paul thought “I don’t believe it!” . For a few months prior to coming to Bournemouth he lived back home with his parents (no rent… no bills… you can see the attraction…) and worked in the laboratory at Cadburys collecting and testing (not eating!) chocolate samples. Paul wishes he was Superman (hence the photograph above). Since 1993 he has been ridiculed (jokingly) for his love of Barry, Robin and Maurice Gibb – Yes Paul’s favourite band are the Bee Gees! He also loves reading, primarily horror novels, but will occasionally stray into the Richard and Judy realm of modern fiction. He loves 1980’s teen movies (Brat Pack etc) and TV shows like Smallville, Alias, Buffy, Roswell… oh and Louis Theroux. Having read that you might think he never leaves his room, however he does enjoy socialising with friends and having a good time.